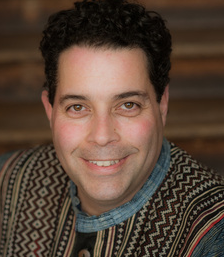 Art speaks with Sustainability Author and Business Transformation Expert, Jeff Leinaweaver, Ph.D.
Art Stewart: You’ve been operating at the cutting edge of the sustainability movement for some time, with a particular focus on new thinking and the deployment of frameworks for reporting. What drew you to this notion of storytelling as a factor in where the movement now needs to head? Jeff Leinaweaver: Two things come to mind, Art: One is that how we are communicating isn’t necessarily working. More people are caught in story silos, spending a lot of time talking at people. It is ‘transmission’ storytelling, where we try to shoot our ideas into other people’s heads with too many facts that people can’t sort through. It is a lot of noise with shallow stories that are overloading people and is very unidirectional. It’s not working and is creating stories that are more maladaptive that don’t enable change. This process ends up where people who don’t believe in climate change, don’t believe that we need more conscious leadership. People have their own camps and we forget that stories are belief systems. Story is the most powerful thing on the planet. It created the Holocaust, the fall of the Aztec empire. It also took us to the moon and told us about what’s possible. The other piece is why story matters and right now, in this time, we need to be bold, to break the trance of the stories that limit us. We need to enable an awakening that embraces change for ourselves, our organizations and communities in a way that drives greater creation of authentic meaning. Art Stewart: This ‘transmission mode’ is no longer serving us or our common aspirations. What can better storytelling offer us now, in the evolution of consciousness? Why is it important to not just change the narrative, but also the way that we create it? Jeff Leinaweaver: One way of responding to your question Art, is why millions can die and people don’t act or care? There is growing research, particularly out of the University of Oregon, indicating that information overload is creating an obsession with data. It is driving a frenzy of transmission storytelling, just fact-telling to people. To actually communicate something, you need to show a picture. For example, in Africa or a war zone, you see a tragedy through the faces of real people. Then the data follows. Every day people hear about numbers of people who were displaced and it begins to wash over us; it fails to get under our skin and really connect. When we stay at this level of transmission storytelling, we are affirming a fundamental human defect. Researchers have found that the more you tell the story of one person peppered with some data, you achieve a greater response with action that makes a difference. Jeff Leinaweaver: Exactly. Yet we rationalize that indeed we are connecting. Another example is with corporate sustainability reports. This movement to accountability has been very helpful in the evolution to greater transparency for business. Yet it is now reaching a plateau as few are actually reading these reports. While the internal conversation that drives production of such reports matters, as people learn more about their organization, it has locked us into “yearbook” storytelling. Within three to five years, if the current reporting model doesn’t change, everything is likely to be scuttled for being ineffective. 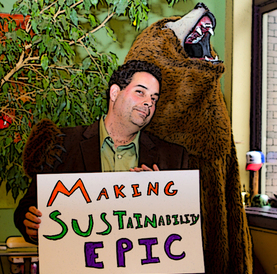 Art Stewart: Your career journey has been deep and wide within the sustainability communications field. The new SASB standards are going to make it easier for companies to report on less activity as SASB will introduce more defined benchmarks for what is truly material in different operational contexts. How do you see reporting changing as a result? Jeff Leinaweaver: I certainly see SASB (the Sustainability Accounting Standards Board) having more impact in the American market. It’s not really a global standard; it is a rules-driven versus principle-driven approach, which is a big difference. It connects to a lot of SEC requirements. People think it’s easy to kill two birds with one stone if you’re reporting something that you have to do. However, often the have-to-dos come about because people crossed an ethical line. So you make a new rule or law to address someone having crossed the line and impacting society as a whole. That is a real deficiency with SASB. The principle-driven approach is a greater conversation. For the reports to go deeper, we have to fly farther ahead than we are right now and tie ourselves to a greater vision. This is a deficiency in the American market – where everyone is caught up in looking at sustainability as an environmental factor when there are a lot of human needs involved; the distinction between needs and wants. When we ‘corkscrew’ into meeting people’s needs, a lot of stories come out. The more you dive into those stories and speak to the haves and have-nots regarding how environmental justice is social justice – and why – people reveal a skeptical view of business and corporate initiatives. It is both an earned reputation and somewhat unfair as many good people working in corporate America want to lead toward a better system. Art Stewart: Your argument runs instinctively contrary to the current mindset within the global responsibility movement: highlighting individual human impacts instead of continuing to justify strategies or agendas within a statistical, critical mass context. For example, the trend to leverage Big Data in framing “evidence-based” policy approaches that emphasize impact patterns based on critical mass, rather than on individuals. Where does your view fit in with this perspective? Jeff Leinaweaver: It is both compatible and different. People ask for data, but they believe stories. Sometimes Big Data is helpful, but if you’re not telling the right stories with a correlating depth or context, it falls flat. It’s how you tell the story that delivers the right brain reaction. Climate change is a good example. The numbers of people who believe in climate change stay roughly in the middle ground of being in denial. Gallup conducted a poll not too long ago surveying over 100 countries with some 4,000 participants to gauge their level of awareness of global warming. Only 67% of respondents had even heard of global warming or climate change, regardless of whether they had learned to agree with it or not. We were not aware of that data and much of public policy is based on numbers for the numbers’ sake. With organizations, leaders need to convey the story behind any ROI argument. Jeff Leinaweaver: Exactly. We’ve learned to tell many of the wrong stories really well and in too many cases, they have run their course. As humans we like to problem-solve and as humanity has progressed, a lot of people have been engaged in making better social worlds for all of us. While humanity has grown to where we figured out how to leverage fossil fuels and move into the industrial revolution, we’ve continued to accelerate that story. However, we are now at a place of so much civilized comfort that we are disassociated from this planet we live on as providing life for us, not the other way around. The wrong stories of industrial progress that we’re telling really well contain a lack of respect for resources at every level, but they are still acceptable. In 150 years, we’ve gone from a global population of one billion to seven billion people, projected to soon be nine billion. With more people and dwindling resources, we have the opportunity to tell different stories because we’re going to have to share more. Or, at the end of the day, we’re going to have more war and competition over resources. Art, you and I along with other colleagues associated with Strategic Impact Partners are working on initiatives to advance next-generation models of conscious leadership. While anybody can be a conscious leader, it’s how we live it on a day-to-day basis and how we practice it 24/7. Like a diet, it comes down to the everyday moments; micro-kindnesses instead of micro-aggressions. They add up! We’re only going to be able to meet our challenges through practicing kindness, compassion and gratitude as a reflection on our own actions in the world. It starts with our own lives and our sense of destiny, personal story and mythology. That then directly moves with us as we walk into the business world, into our own organization, our workaday world where we are presented with choices. Are we going to continue floating through the bigger questions in life or are we going to demand an accounting of ourselves and our organizations as leaders? We forget that organizations are, in essence, simply groups of people coming together in agreement on a collective assumption about reality. The brand image can sometimes disconnect us from our humanity. We’re at a distinction point between the “me” versus the “we”. It is particularly evident with nonprofits and other change initiatives where 37 heroes show up and nobody can change a single light bulb. People start back-stabbing each other over whose heroic story is going to win over all the others. Can we move beyond the personal mythology to a “we” or collective story? Art Stewart: In your book you call out the notion of urgency: If we are unconsciously engineering a reinforcement of detachment in our communication narrative, how do we re-inject urgency into the storytelling so that real change can take place? Jeff Leinaweaver: We live now where urgency only comes connected to an emergency. Because urgency is understood as a kind of punctuated moment, we are less aware that we’re living in the middle of a long emergency right now that requires a new awakening. The history of humankind is filled with situations where one civilization survived and one did not, principally on their cultural story of who they were and who the “other” was – about how the world and the cosmology operated, and their relationship with the environment. That’s what’s going on right now with business and our communities. We need to characterize the change we’re trying to make and stop optimizing outdated systems. People are telling stories that no longer have resonance; we cannot connect. Another notion is how do we make things sacred? Many people have lost their way in seeking to live in a more sacred way. We are surrounded by trends based on a perspective of scarcity, which creates a certain response. How do we move from scarcity to relationship and a co-creation of abundance with respect for not only each other, but where we live? 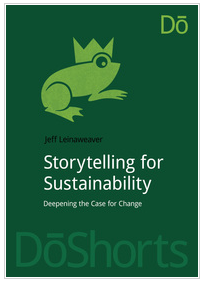 Jeff's latest book, Storytelling for Sustainability: Deepening the Case for Change offers a comprehensive primer on storytelling as a whole-brain practice, where it is as much an intrapreneurial exercise as it is an approach to strategic communication and social change.